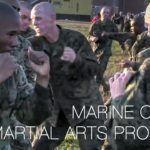 U.S. Marine Corps recruits conduct pugil stick bouts as a part of the Marine Corps Martial Arts Program (MCMAP) at Leatherneck Square, Marine Corps Recruit Depot Parris Island. A pugil stick is a heavily padded pole-like training weapon used since the early 1940s by military personnel in training for rifle and bayonet combat. 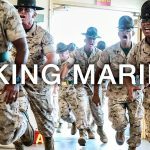 It was initially adopted by the United States Marine Corps, but was later included in United States Army combat training as well. 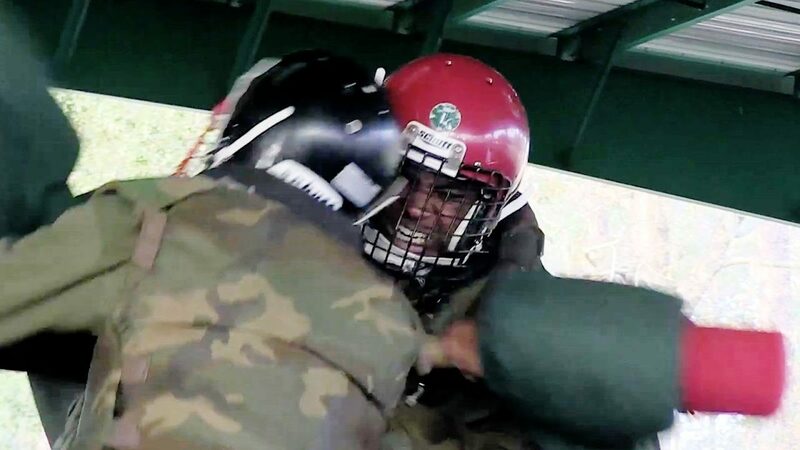 Pugil bouts are usually conducted with hard contact while wearing protective gear such as groin protectors, American football helmets, hockey gloves, and chest protectors or shin guards, such as those worn by baseball catchers. Some pugil sticks are made with integrated hand guards to reduce the potential for injury. 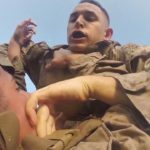 Military procedures for pugil bouts are often detailed, with United States Army and United States Marine Corps both prohibiting pugil training by anyone who has recently suffered concussion of the brain, lest they suffer traumatic brain injury, or had a tooth extraction within the past 24 hours. 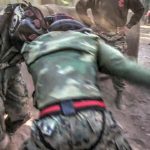 Pugil stick bouts are used to simulate close quarters combat and build proficiency of rifle bayonet techniques. 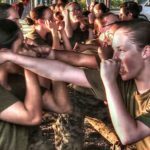 Posted On November 18, 2016 in Marine Corps, Military with 0 Comments.Tagged: Marine Corps Martial Arts Program, Marine Corps Recruit Depot Parris Island, MCMAP, pugil stick, Pugil Stick Fight, Pugil Stick Fights, Pugil Sticks.